A growing collection of copyright free images of shore birds. From all over the world, or even perhaps your own back yard, these birds make their homes on the edges of our oceans, rivers, lakes and streams. From the exotic to the everyday, this collection of copyright free bird images is far from the ordinary. 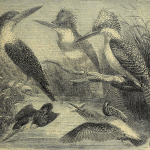 Vintage kingfisher engraving with 5 of the world’s kingfisher species. 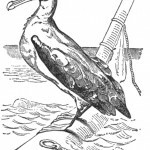 Vintage albatross bird drawing. This aquatic bird is the largest and strongest of all of the sea birds. 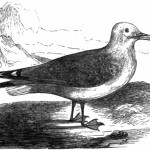 Public domain bird drawing from 1911. Vintage, black and white kittiwake gull drawing. Book illustration that dates back to 1848 thereby putting it into the public domain. 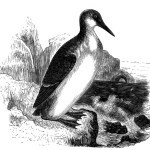 Black and white guillemot drawing from 1848. This penguin-like bird was found by holiday travelers to the Isle of Wight. 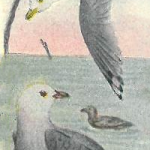 This vintage sea gulls drawing was created by C.A. Reed. It is beautifully colored in tones of gray and blue with a pink sunrise or sunset. 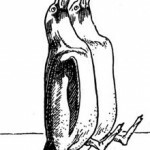 Drawing of a pair of marching penguins. Wonderful, vintage bookplate of a variety of shore and water birds. 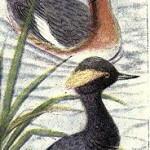 Vintage colored drawing of a pair of grebe birds. 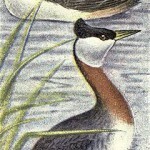 Black and white drawing of a grebe bird among the reeds. 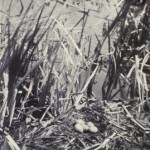 Vintage black and white photograph of a Holboell’s grebe nest in a marsh. 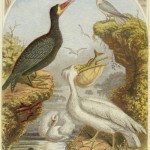 Colored drawing of a trio of grebe birds. 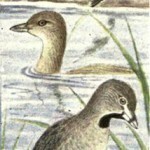 Vintage picture of three grebes.